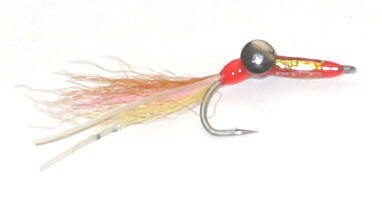 Here is a very effective fly that gets down quick for corbina that we are offering for sale and in the surf pack – Gary. The fly is intended to impressionistically imitate the ghost shrimp that swims with its claws together in front of its body and uses its legs for power (much like brine shrimp). It settles to the bottom (not dives) and uses its tail to bury itself in the sand. The naturals are basically cream white or orange in color with irregular banding and mottling. The machined brass eyes are tied under and behind the hook point leaving plenty of room to form the body and prevent the finished fly from diving head first into the sand. The thread shield is placed on the fly to protect the thread wraps that hold the brass eyes to the hook from the ravages of the sand bottom. The weight is the part of the fly that takes the greatest beating during a retrieve. Taper the lace to provide a neat tie-in. This material can be purchased from a craft store. The claw (tail) is tied approximately 1/3 of the way around the bend of the hook. The claw will stick up out of the bottom while the fly is a rest. It is important to keep the claw material quite sparse. The antennae are tied on each side of the claw (Ghost shrimp don’t have these but they make the fly look good and the corbina are not smart enough to know that something is amiss) extending just longer than the claw. I use a 5-inch strip of Sili Legs (actually a strand from a bass spinner bait skirt), loop it to form the antennae and later cut the loop to form two legs. I use only two legs because I am sure corbina cannot count. The body is tapered thread which is over-wrapped with Flashabou. The body must be tapered very smoothly with thread in order to allow for easy wrapping of the Flashabou. Tie the Flashabou in behind the hook eye, wrap it back to the hourglass eyes in close spirals then wrap it back to the hook eye and tie off. Whip a small head. The body and all exposed thread are protected from the sand with 30-minute epoxy. I find that this slow cure epoxy penetrates nicely and provides long lasting protection.